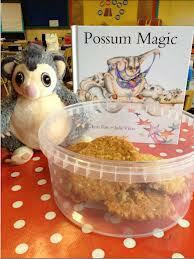 Kiddie book club – run by parents! Why: we aim to inspire parents to really get into a book and show their kids how much fun it can be. By doing something different like focussing on a book for a month, we hope it will renew some excitement in the home and get your ‘fun parent’ on! And for every fun moment you have, please post on our ‘I raise my kids’ facebook page to inspire more parents to take book reading to another level. What’s involved: having fun with books! If you don’t have the book, look into buying it or reserving it at your library. 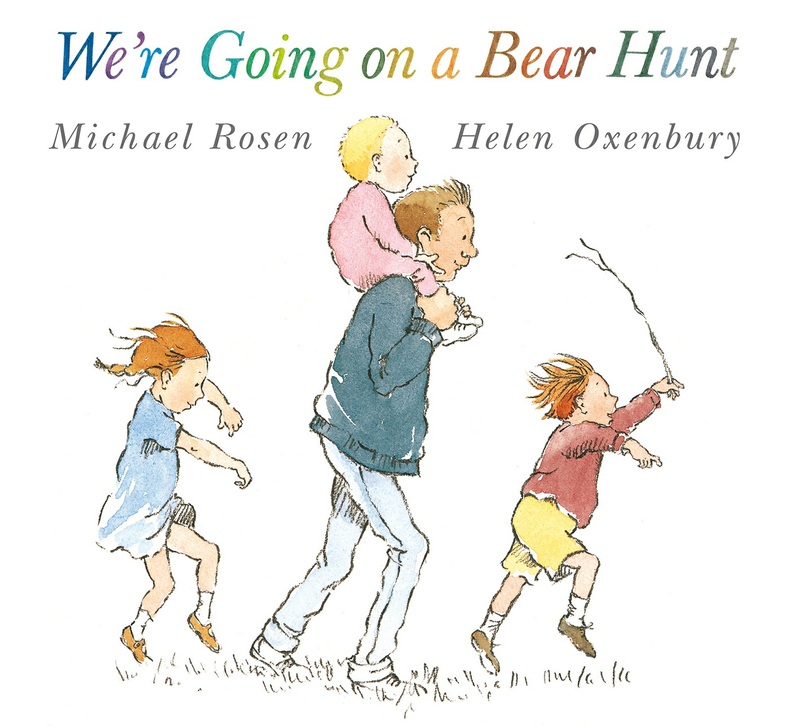 Otherwise, remember to announce to your little ones that ‘we’re going to read this book a lot for a few weeks. Let’s have some fun with it!!!’. TIME OUT!! How to carry out an effective ‘time out’!!! It is so effective you will rarely ever have to use them!! What is a time out? Is it a punishment for your child, who has done something wrong? Is it a way to give yourself time to ‘recuperate’ after your child’s behaviour? Is it a constant struggle to get them into a time out? Lets look at ‘time outs’ a different way! An effective time out is giving your child an opportunity to ‘reflect’ on what has happened or what they have done. For this refection to happen you will need to help them reflect!! A child first must understand why they are having this time out!! This is when our family rules become important!! Ask “Do you know why you are having a time out?”. Hopefully you get a response. Usually a child will not be able to communicate or be in charge of their emotions. That is why they are given time. I prefer calling it ‘Thinking Time’!! Some children need support during this time. If your child is new to ‘Thinking Time’ you might have to talk them through the process. “You are here to think about how you feel, how your sister is feeling and what we can do to make things better”. I will come back then we can talk about it. When the time out has finished make sure you have a ‘talk’, then help them resolve the problem and enter back into their play. You can use your pictures that you have on your ‘family rules’ to help communicate this to your child. It is for this reason that I don’t believe you can use ‘time outs’ on children under 2. There are lots of studies that support that under this age a ‘time out’ can have a negative effect on a child’s emotional development. Theorist have shown that the only effective way to change negative behaviour is by a ‘significant adult’ to offer reinforcement of positive behaviour. The funny thing is that children can’t easily differentiate between negative attention and positive attention. A time out will not change your child’s behaviour! It is the end result. The only way to change the behaviour is to understand why it happened in the first place!! With out this understanding you will just be constantly putting out fires!! Remember children need lots of positive support when they behave well but they need even more when they haven’t!!!! Like if you want more information about behaviour strategies. Or ask me direct questions about certain types of behaviour, maybe I can help you find the trigger. From the very start Research is showing that your baby has been developing their tastebuds and ‘palate’ since they were in your womb. All based on the foods that you were eating when you were pregnant! Yes, so long ago.. This is just the start of how your child’s palate gets shaped. Breastfeeding If you happen to breastfeed, your child’s palate gets further shaped, depending on what you eat. The flavours in breastmilk change accordingly, whereas the flavours in formula remain the same. Introducing solids When it comes time to introducing solids, this is already the time to start thinking further on shaping your baby’s palate. Sure you can start with rice cereal but you can also think outside the box. Fruit and vegetables can give much more flavour and good nutrients. 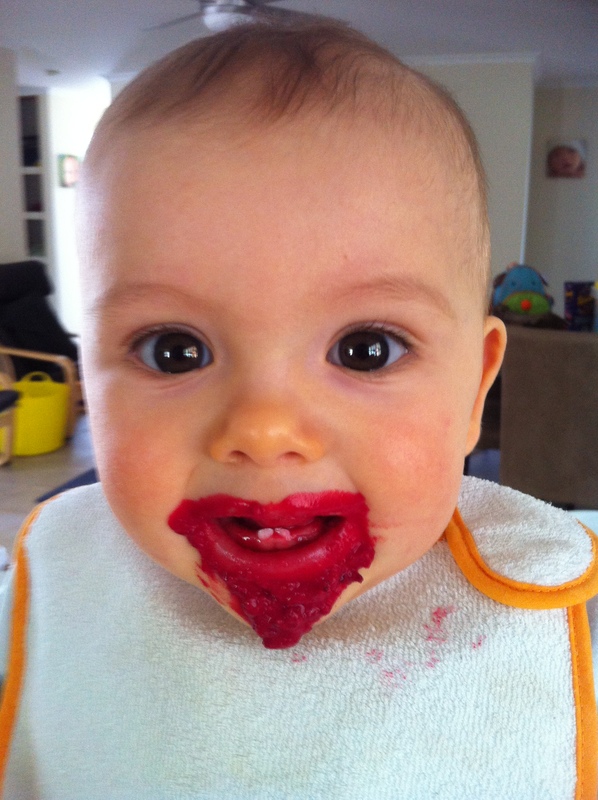 I am yet to come across actual evidence that says fruit creates a ‘sweet tooth’ but vegetables probably have better nutrients for a little one, so maybe err on the side of caution and push the veges! Talk is even out there as to whether an ideal first food (or in the first few months) would be avocado with the good fats and not so much a ‘fodder’, like rice. (Any grains early on can also irritate the gut and lead to allergies and intolerances). Treating them like a new food, you could introduce a herb, spice or garlic closer to 12 months. If you have been eating these yourself in the pregnancy, chances are your baby will already be accustomed to the taste of them. Keeping it going The best thing about feeding your baby is, you can get them used to any food! Foods you love, foods you dislike, foods you wish you would tolerate more. Again, think outside the box, babies all around the world are being introduced to very different foods than just rice cereal. One website that dedicates itself to this is http://www.homemade-baby-food-recipes.com. A baby’s palate is such a blank canvas, that as long as you keep up exposure to the food, they have the potential to be a healthy eater that appreciates a wide variety of foods. But it does all rely on you, providing the food. Yes, some responsibility! Did you know a child’s food preferences are shown to reflect their parents’ food preferences? But you can introduce them to a food that you might not eat. Have a look through the supermarket for something that you and the family could try together. The nasties These days, everyone is talking about how food is linked to later obesity, disease, cancer and even problematic behaviour in childhood. Teaching your child to avoid these is easiest if started early, before they realise they are being ‘healthy’. Salt – the Australian National Health and Medical Research Council has started showing how many children are consuming up to five times the recommended daily salt intake. This can lead to future kidney issues and high blood pressure. Sugar – has no nutritional value whatsoever to a child. And considering their tastebuds don’t have to know any different, sugar is only adding to risks of childhood obesity, tooth decay, heart disease, type II diabetes, depressed immunity, just to get the list going! Food additives – include colouring, sweeteners and preservatives. All of these are starting to be linked with many symptoms, health issues and even suggestions they are changing our DNA. www.fedup.com.au is a great place to start to see that symptoms from bedwetting to ADHD type behaviours to anger, depression and sleep issues are all very real and relate directly to food additives. Start looking at labels of everything you give your baby/child. The fresher the better. How much processed food does your child consume (which adds in more salt, sugar and additives)? If an ingredient doesn’t sound like a real food (eg. thickener, stabiliser, acidity regulator, glucose syrup), see if you can think of a better alternative. Compare brands. For example, Sakata plain rice crackers have no preservatives or other additives. Every other brand and flavour does. Remember, your baby doesn’t know (or care) about what they are missing out on. Their ‘treats’ might be pasta and fresh pesto or some banana with cinnamon, not necessarily jelly, ‘fruit’ bar or cake. Teach a young child that some foods help their body to grow, some are just for fun. Fun foods are only eaten on certain occasions (determined by your family). You provide the healthy food, your child decides which and how much they will eat. Something to keep in mind : the majority of your child’s preferences in tastes will be developed by 4 years of age…. 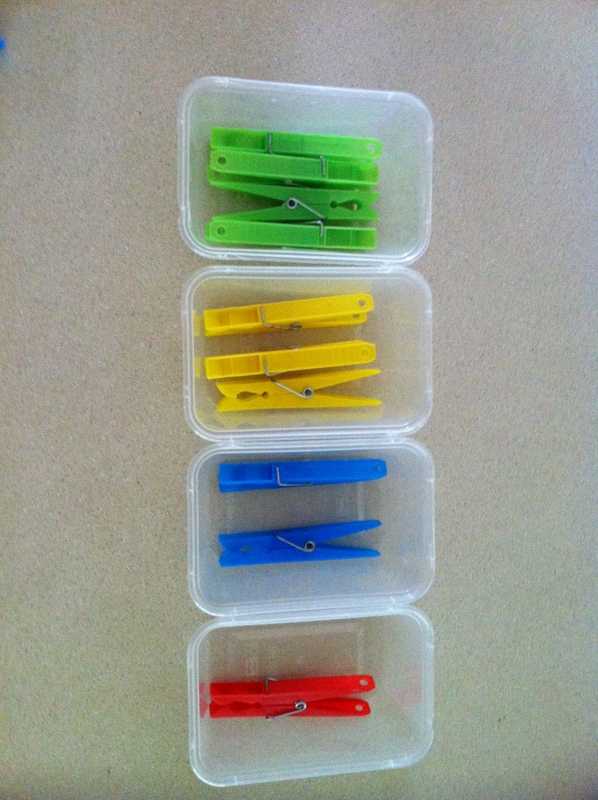 [~12 months on] Add ‘pegs’ and (cheap) ‘containers’ to your next grocery list and have fun teaching your child about colours, counting and more! And that’s before we even think about adding them to a pretend play scene! I store ours in our laundry cupboard so the kids can discover them and play when they want to. Little ones will need to ask ‘help’ to get the containers open. With the younger ones (around 12 months), you might start with just two colours. 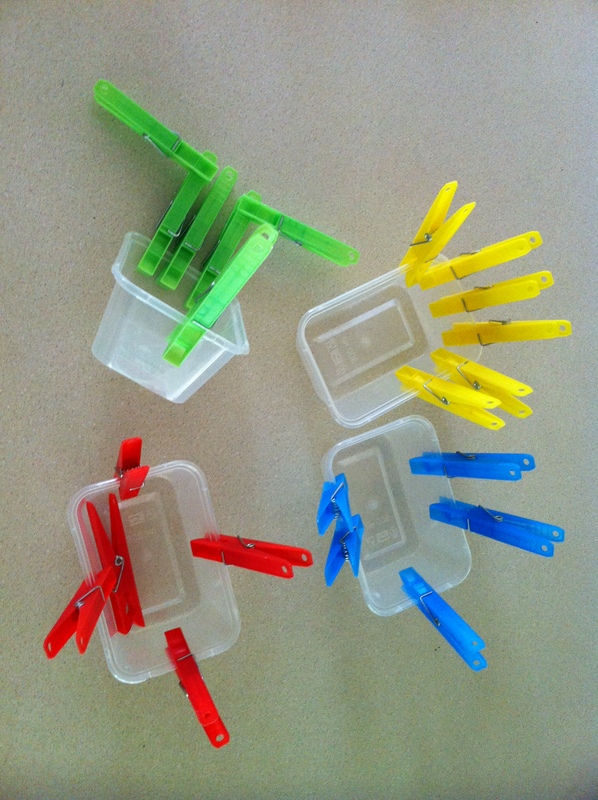 Encourage them to match each peg to it’s correct container (see above). 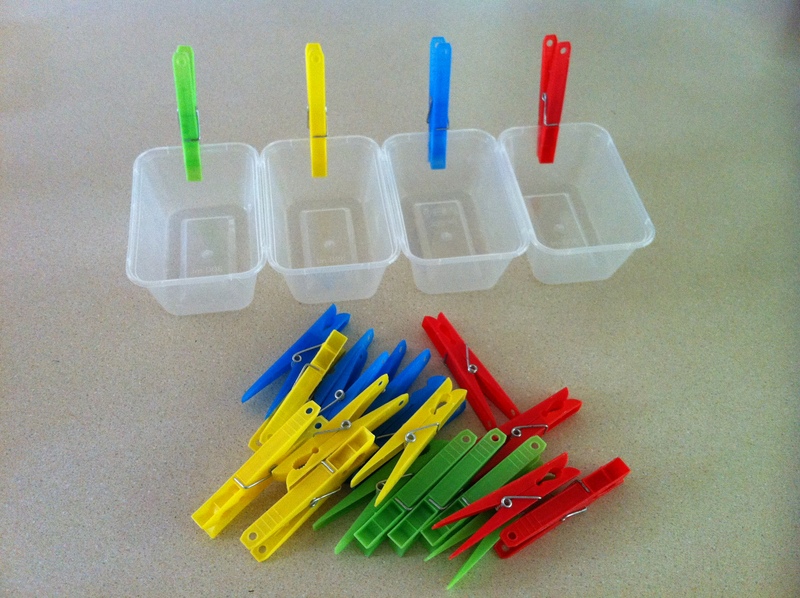 Remember to name the colour each time they put the peg in – your child can learn the names of colours through your repetition (‘blue..red..green..blue..green’), rather than having to ‘learn’ them down the track. 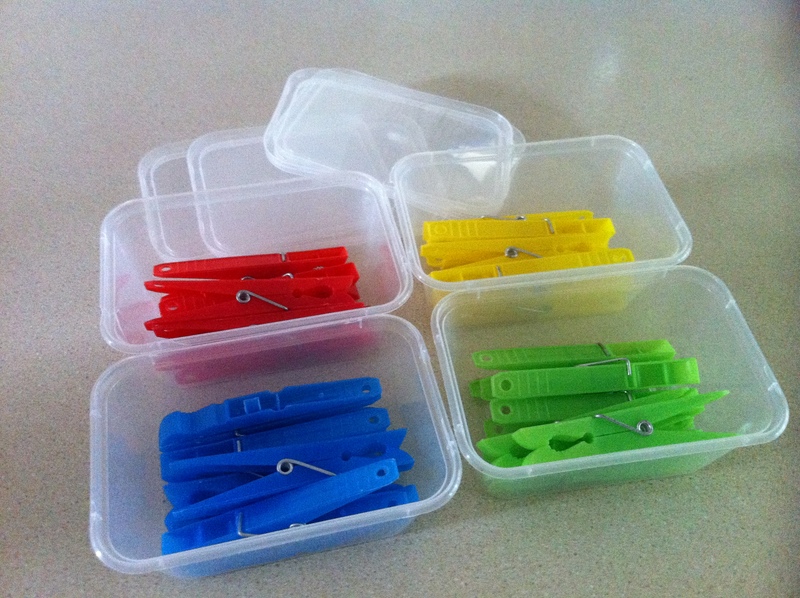 Another time, you might start labelling ‘same..different…different..same’ as they attempt to put the pegs into the containers. Later, you might start saying ‘I wonder what this colour is..?’ to see if your child might say the name. Or you can start naming the colours and then stop and wait…. a nice way for a child to learn colours rather than being tested (what’s this colour?, what colour is this?). And if they don’t say anything, they probably aren’t ready to say the colours expressively yet. That’s okay – just keep naming the colours for them! For the older kids, talk about balancing the containers. How many can the container take on one side before it tips over? Let them experiment. This is a fun one to relate to ‘Who Sank the Boat’?’ book – first the cow got in (put the peg on), then the donkey got in (make her balance her weight!) etc. Have you ever studied a peg? See it through a child’s eyes. What is each bit for? Use the appropriate language – ‘look the end bits are rounded‘, ‘this is the spring‘, ‘we need to pinch these bits’, ‘this bit holds onto the washing line AND the clothes’. What happens if we take the spring off? What is it made from? If we lost all of our pegs, how could we improvise? Do you know what ‘improvise’ means? 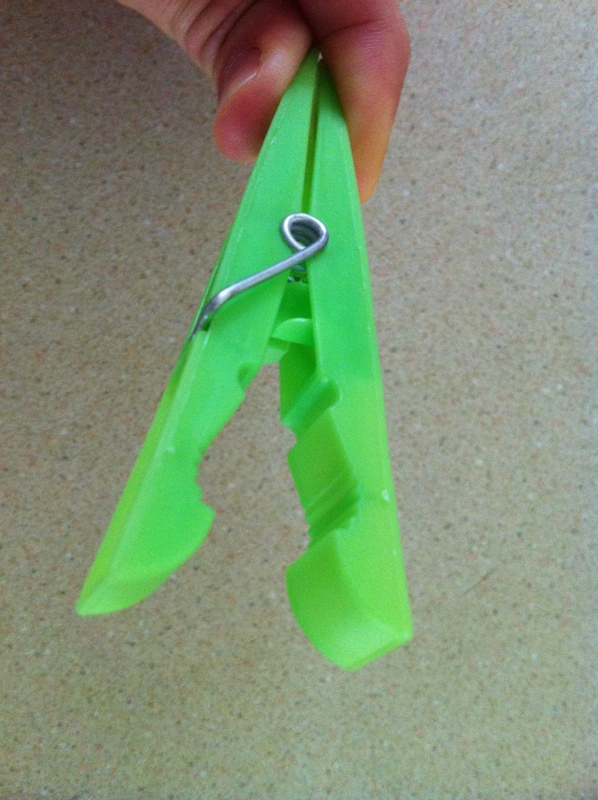 I wonder who invented the peg? Do you know what ‘invented’ means? Does your child have problems at school or daycare with someone that is ‘picking’ on them? How do you deal with this?? Here is a great start!! Share this link with as many people as you can!! Bullying is not acceptable in any form!! We need to empower our children to say ‘Hey thats not ok’!!! More empowering activities and strategies to come!! But please share this link you might save a child!! Is it ‘okay’ to ‘sshhh’ your baby? Have you ever said to your little one ‘shhhhh, it’s okay, it’s okay’, putting on the big, brave smile? Either to your baby when you are not sure why they are crying, to your toddler when they fell over and started to cry or to your preschooler, crying when something didn’t go the way they expected. By saying ‘shhhh’, we are telling our little ones that crying is not on and by saying ‘it’s okay’, we are telling them we don’t acknowledge any other feelings. But in fact, for a child to have good emotional intelligence (that’s another post), the first step is to help our children identify what emotion they are feeling and to encourage them to deal with it, which before they mature is to probably have a cry about it! It sounds easy but it does take some practice to stop yourself from shushing and saying ‘it’s okay’. Instead, try being there for your little one (especially the babies) by just holding them. You might say ‘mummy is here’ or ‘you hurt yourself’ or you might start thinking about labelling which emotion they are feeling (for example, you are sad, you are disappointed). Sometimes, it does take some thinking as to ‘which emotion are they feeling right now!?’. You will get better at it each time. Try to reflect their emotion on your face (for example, frustrated or sad), before showing a reassuring smile. For babies, it might be ‘sad’, ‘hungry’, ‘tired’. For toddlers, ‘disappointed’ will be a new one as might be ‘unsure’. For pre-schoolers, it might be ‘frustrated’ or ‘angry’. Don’t be scared of labelling them! You can also label the good feelings at other times. ‘You are so excited!’, ‘wow you are happy’. The next step is to help them work through this emotion but that is another post! Timing in with Food Allergy Awareness Week this week, I have decided to cut a LONG story short and share some of the things I have learnt and some of the experiences I have had being a mum of two children with food allergies and intolerances. Master 3 first got eczema some time after his birth and we started the GP shopping. We had ‘experts’ who recommended parrafin wax (a known carcinogen) which played up even worse with my son’s skin, we had others who diagnosed school sores/dermatitis/psoriasis, you name it, only to find out it was and still is eczema and we have GPs who have sworn there is no link between food and behaviour and food and eczema! We have spent a small fortune at the chemist on creams from natural to steroids and back again. I am sad to say we did take their advice and I have thinned my son’s skin out with steroids, put parrafin wax on him, and more and nothing really worked anyway. It was when Master 3’s eczema got so bad and he was so beside himself, the mother guilt really set in. GPs threw anti-biotics, prednisone and more steroids at him and nothing worked. I turned to naturopathy in desperation. Master 3 ended up on a gluten and dairy-free diet and 6 weeks later, the behavioural changes in him were INCREDIBLE. 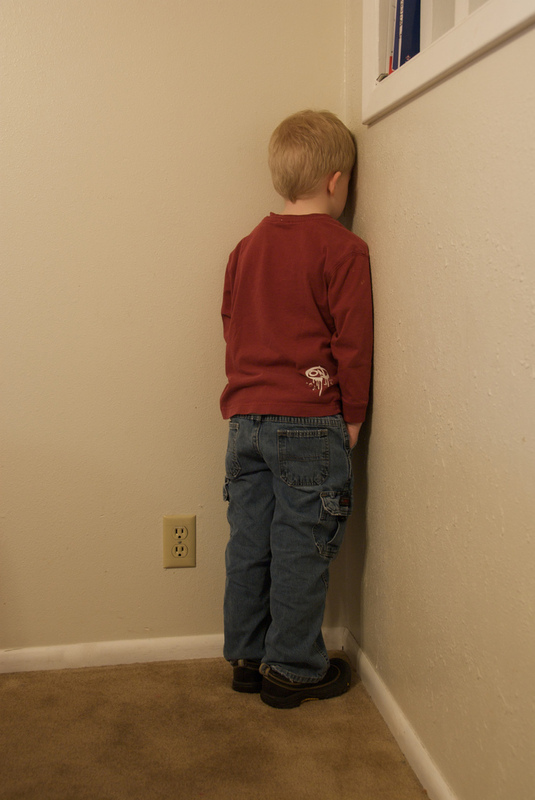 I had always said it was like he had ADHD but all of a sudden he ‘turned a corner’ – following directions, thoughtful, agreeable, calm, and no ‘naughty’ behaviour, just playing by himself for ages. We didn’t pair the diet with his behaviour and were questioning whether the diet was doing much for him. So we let him have a piece of cake – the next day he was back to ADHD and the eczema was back, clear as day. In the meantime, from other parent reports, I heard about allergy prick tests. So we got that done. Master 3 reacted to everything yet we were told none were significant except dust mites. It didn’t sit well as I knew he had issues with gluten at least but the doctor didn’t want to know about it and I could tell he didn’t know much about intolerances. Unfortunately, the eczema still didn’t clear properly and one day Master 3 was just looking so ‘unhealthy’ (see picture) so I decided it might be best to go to the dietitian to see if they could shed any more light and also to look at his diet since we were definitely staying off gluten. We started an elimination diet to go back to basics and then start adding in foods with salicylates, amines, glutamates and finally dairy. Four months later, and we have still not gotten to dairy as we are STILL trying to work out which foods Master 3 cannot tolerate. The trouble is, sometimes eczema is caused by a build-up of one food or a group of foods (eg. amines), so you don’t see it for a long time. But other times, it does appear straight away, which is so helpful! It all seems so simple yet when you’re actually doing it, it is so so confusing. People ask why I haven’t kept a food diary – mostly because I haven’t had time between appointments, cooking, checking skin, dealing with the ADHD behaviour, let alone day to day life! In between all of this, I started realising Master 1, then about 6 months old, also had eczema on his cheeks. He also had a prick test and of course that revealed ‘no allergies!’. But as soon as I took the gluten away, the eczema went away. We added it back in, the eczema came straight back. Master 3 had another flare up and after a couple of weeks of eczema and ADHD behaviour, I finally realised we had finished his bottle of fish oil a while back and hadn’t bought a new one. The next day, calm, gentle Master 3 was back and the day after, his eczema was all gone! So we had another win! I got confident after that, thinking maybe it was not so much the food chemicals (ie salicylates/amines/glutamates), but the fish oil! Oh the speculating!! I had done a lot of reading by this stage which talks about some children having a ‘leaky gut’, where food chemicals slip into the bloodstream and head straight to the brain, giving them the ADHD behaviour. It is very common with the children with autism whom I work with and I have now seen it for myself! The next professional was a kinesiologist. I had high hopes and we were trying a different angle, first dealing with Master 3’s ‘psycho-emotional’ issues which can affect how the body works, which lastly affects the skin. We ‘cleared’ some energy and I swear Master 3 was a different boy. We also had chinese herbs and ‘thuja’ to help his thyroid hormones but no improvements with his skin. In fact it got worse, as we introduced glutamates – corn, sultanas, peas. A big no! Hello eczema and ADHD again. It was pretty upsetting as a gluten-free diet includes a lot of corn. 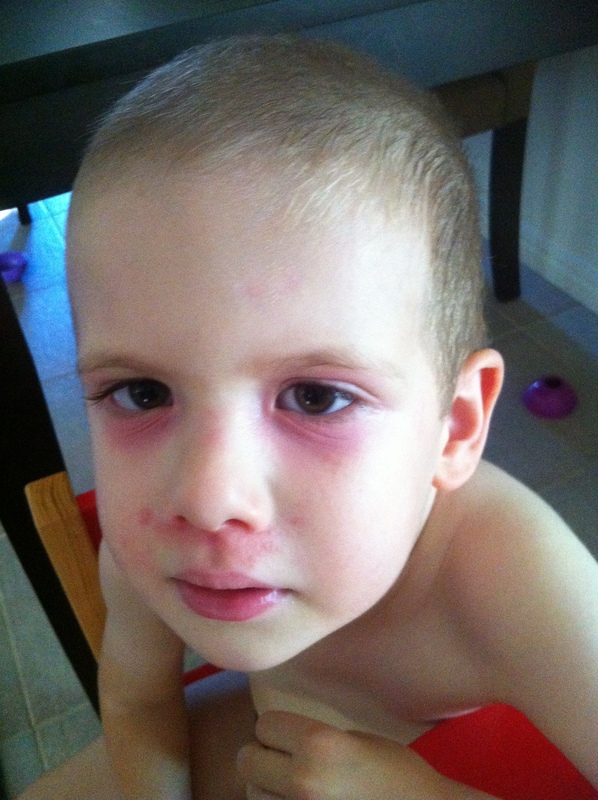 Over a month later, and we have not been able to get rid of the eczema or behaviour. I have contemplated steroid cream again, I’ve contemplated throwing in the diet and I have contemplated the most ridiculous things causing it all! We had run out of private health benefits for further kinesiology (which I do believe would probably help in the end), but without any idea of a timeline (and the kinesiologist did not ring me back or return my email), I feel like we are out on our own. It is a very unfinished story! But on the positive, I have since found a facebook page and blog – Feeding two growing boys which links in thousands of parents of children with food allergies and intolerances whilst providing up-to-date research on the real link between eczema and food. Finally in Food Allergy Awareness Week, I thought I’d list some of the costs, a food intolerance or allergy can have. Coming home from the naturopath fathoming how to break the news – ‘doesn’t deal with change well’ Master 3 (just 2 then) was about to start a gluten and dairy-free diet, let alone a pile of concoctions and elixirs was pretty hard. All in the week I was due to start back at work and was busy trying to keep up with baby food supplies for Master 1! It was almost too much to think about. Dealing with a two-year-old for over a year who was impulsive, rough, couldn’t listen/follow directions/look you in the eye, could only roll around on the couch and couldn’t get his brain together to do anything more, yet after 5 minutes alone, he would rip up his favourite books and toys, smear poo, put soap all through the bath, rip down the washing etc etc! The disappointment seeing Master 3 with his ‘ADHD’ behaviour again after his gluten trial and having to put up with the tearing up of the house and all of the other ADHD issues without knowing how long it would take to clear the gluten from his system. Coming home from the dietitian thinking about breaking the news of an ‘elimination diet’ – egg, cashew, pear, green beans, meat, rice, quinoa, legumes and carob. All right before his upcoming birthday and Easter. Wrapping my head around creating breakfast, lunch, dinner, snacks and treats out of the above foods, week after week. Going from having a ‘party piglet’ who used to love trying all the new ‘party foods’ to dealing with birthday parties and seeing Master 3’s eyes immediately check out the food table. Not to mention any other meeting around mealtimes with other kids and knowing he was wishing he could have some. And currently seeing Master 1 eating some foods or the ‘just a little bit?’, tearing at your heartstrings! The confusion for Master 3 as we chopped and changed what he could and couldn’t eat only JUST managing to always have some treat that he could have. The highs and lows – professionals telling us they can help Master 3, finding gluten-free and fish oil worked to the frustration of yet more money spent, the sinking feeling of seeing eczema or Master 3 ‘acting up’. Master 3 getting upset with himself ripping his favourite books up, getting into trouble for his crazy behaviour at home and at daycare when he does not want to be like that. Constantly thinking about food and Master 3’s psychological well-being and health. Spending hours in the kitchen as it is the easiest way to deal with the elimination diet is to cook it ALL yourself – cashew butter (no usual spreads allowed), pear chutney (no nuts allowed at daycare), hummous, pesto, mayonnaise, cake. The mental energy in thinking about who is the next best professional to see about this, where can I get better information from if the medical world doesn’t know, dealing with the ‘he’ll probably just grow out of it’ comments, writing a menu for the week (including the rest of the family’s dietary issues and Master 1’s sensory pickiness) and basically serving 3 different meals at every mealtime. Constantly thinking about making sure we have enough food in the fridge for 2 hungry boys as I can’t just go to the pantry and find something else. The cleaning up from Master 3’s ADHD behaviours, having to have lightning quick reflexes, getting so nervous taking him out in public, constantly managing his behaviour but trying to have ‘understanding’. Taking Master 3 (and a new baby) to sit in waiting rooms for hours for all of the appointments, whilst trying to keep him behaving appropriately. Thankyou to everyone who has taken the time to read this. Please pass this onto anyone that may be interested or also looking for answers. Have you tried searching for your child’s favourite books, nursery rhymes and songs on YouTube? This will capture every child’s attention, even from the very, very young ones and is a good alternative TV. But of course not as good as the real deal with you reading/singing! Please add the link to any of your favourites too as it saves a lot of ‘trawling’ for the good ones! 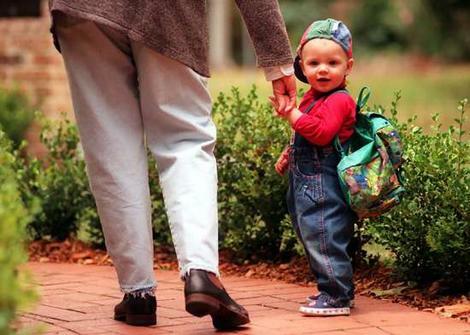 When is it a good time to start looking for a childcare centre? My answer as soon as you are pregnant or even contemplating the idea of returning to work. The reason, it is so important to start this search, is so that you do not have to take ‘whatever’ come available. Trust me, there is childcare and there is QUALITY childcare. First, go to as many as you can!!! You might really feel very happy with the first one you see but you need to understand that staff are very good at selling their centre. To an inexperienced eye you might get carried away with the sales pitch. Have a look at the space. How much room do the children have to move. Small classrooms and play areas, might look safe but they also can feel overcrowded and the noise level can become overwhelming. Many new centres look beautiful and clean but the classrooms have been built to the minimum requirements for space. (Floor space:child ratio per regulations). Studies have shown that children that have alot of space to move are happier (just like the chickens in the egg farms). What does the inside and outside environment tell you? What do the posters say? Art work? What do they value enough to display on their walls of the rooms? If you find that the walls are empty, ask why?? If all the artwork is all uniformed, ask does this centre encourage creativity? Does the centre feel like a comfortable place, or does it feel a little sterile? Are there gardens outside? Vegetable gardens? Trees? All of these things can help you to see whether the staff put ‘love’ into their environment. Many passionate carers believe the environment to be the ‘third’ teacher. This means that they will put alot of effort into making the environment as inviting, wondrous, warm and exciting as possible. Remember learning begins at play (but thats another post). What are the children doing? Can you hear lots of disagreements? Are the children playing in ways that are dramatic, constructive, creative and friendly? Or are they walking around aimlessly, sitting by themselves with security ‘toys/blankets’. How are the children using their environment? The biggest resource in any centre is the staff!!! If this resource is faulty, it doesn’t matter how beautiful everything else is, it won’t work. How are the staff interacting with the children and their environment? Are the staff sitting with paper and pen away from children? Are they talking to other staff? Are they sitting down with children around them adding information to the children’s play and learning? Can you tell that the staff love the children? When you walk into the room, the staff are on their best behaviour!! So if you see something you are not happy with and this is their best, imagine what could be their worst. I have seen and heard of some terrible things and not all centres are QUALITY!! If your are able to answer these questions about your centres you are looking at then you have looked at them with more educated eyes!!! This is for the first visit. The next visit needs to be at a different time and we need to ask questions to see what responses we get!!!! Well done you have completed the first stage of what is a very emotional and important decision. Like if you would like to know the questions for the next visit!!! !